This 1985 Modena Spyder California is significant based on its association with an important person and events in American history and culture. The Ferrari replica featured prominently in the iconic John Hughes film Ferris Bueller’s Day Off and has become the tangible embodiment of the classic film’s enormous popularity within American popular culture. The famed “Ferrari” that appeared in Ferris Bueller’s Day Off was actually a replica built in 1985 by Modena Design & Development (El Cajon, CA). It was modeled off of the Italian built, Ferrari 250 GT California (1957-1963). The two-door, two-seat, front-engine sports car featured a 1974 302 c.i.d. Ford V-8, C-4 automatic transmission, and rear-wheel drive. Neal Glassmoyer and Mark Goyette built the fiberglass convertible on a custom tube-frame designed by Bob Webb and constructed by David Turley. Glassmoyer and Goyette sourced parts from many different automobiles to replicate as close as possible, an actual Ferrari and create a well-handling performance sports car. Torsion bar suspension is used front and rear, adapted to Ford Mustang A-arms at the front, and a Ford Mustang solid axle at the rear. The windshield is from a Fiat Spider 124, taillights are from a VW Type 3, trunk lid is from a MG MGB, the speedometer is from a Jaguar E-Type, and the front bumper is from and MGBV and the rear is from a Volkswagen Karmann-Ghia. In 1984, Mark Goyette and Neil Glassmoyer built a one-off fiberglass replica of a Ferrari 250GT California (1957-1963). Although constructed for a customer, this car was a prototype of the cars they planned to build for their newly established company, Modena Design &amp; Development in El Cajon, CA. In the spring of 1985, before they had a chance to launch the business, their prototype attracted the attention of John Hughes a Hollywood movie director and writer. Hughes was working on producing the film Ferris Bueller’s Day Off, and thought the Spyder would be a good stand-in for the Ferrari he wanted the characters to drive. An actual Ferrari was too expensive for the studio to rent or use. Hughes called Glassmoyer and Goyette to bring the prototype Spyder to Paramount Pictures Studios so he could check it out. After seeing it in person, Hughes requested the car for the film, but since it had been built for a customer, Goyette and Glassmoyer couldn’t loan it out. Instead, the studio agreed to lease a complete car, purchase a partially complete car and a rolling shell. Goyette and Glassmoyer then embarked on hastily building three cars on a tight timeline for the film. Despite long nights, they were successful and all the three cars in various states of completion were finished for their film debut in Chicago in the fall of 1985. 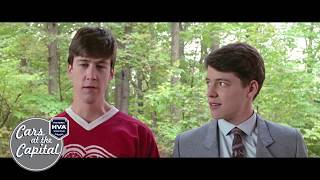 The film Ferris Bueller’s Day Off premiered June 1986. The car that was completed and leased to the studio (the car that is documented for the National Historic Vehicle Register) was used for the wide shots where it shows the entire car. The partially completed car that was sold to the studio was used for the shots of the actors in the car and the rolling shell was used for the scene where the car is launched out of the window. After filming was completed, the leased car was returned to Modena Design & Development. The studio used it for the jump scene and the car had suffered significant damage. It was repaired by Modena Design & Development and sold to its first private owner, Dorian Kunch in San Diego, CA. The car changed hands a number of times and exhibits various updates and modifications that were performed by its various owners. By 2003, the car had been sold to an owner in the United Kingdom. The current owner, Bob Winegard, purchased the car from a Bonhams auction that was held April 19, 2010 at the Hendon, RAF Museum in the United Kingdom. Mr. Winegard had the car shipped to the United States and subsequently had the vehicle restored and returned to its movie specifications by Greg Weldy of AmericanCoventry in Highland, MD. Following the release of the film, Modena Design &amp; Development was sued by Ferrari, as were other replica and kit car builders. The case was settled out of court with Modena Design &amp; Development allowed to continue production with minor changes. The company went kept producing complete cars and different “stage” kits and Keith Knapp purchased the company in the late 1980s. Today, Mark Goyette owns an antique car restoration shop in Bennington, VT. Neil Glassmoyer is based in Phoenix, AZ and is producing a new line of Modena Spyder Californias – here.